Doubt anyone plays these 2 games but if you do, please try and better the times, I'm laying them down. EDIT: Reuploaded both (in 4:3 this time) and set a faster time on Ski Champ. 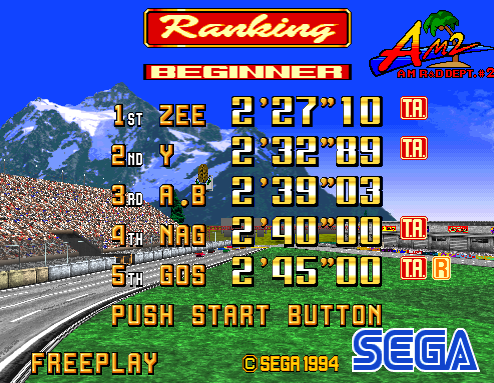 So I finally was able to get on Sega Rally 2 Again. I finally managed to get first on Championship for the very first time with the Lancia Stratos. I didn't record the act, Unfortunately. But I do have the record. Yeah, I beat the time from 2014 by only a small difference, I know. Now I gotta attempt to win the mode with the Impreza. That's some insane driving ! Is that time with or without the pit stop shortcut...? Ian wrote: That's some insane driving ! Cheers, Ian. Cheers to you, then. Thanks for the compliment. I doubt any of you guys play this game at all, but I've been tinkering with Jambo Safari on Demul. I've mananged to get good enough at the game to S-rank all stages and catch the Phorousrachos (the giant, prehistoric bird). I've even recorded a playthrough with the Phorousrachos that I will upload to YouTube sometime. Anyone else played this?